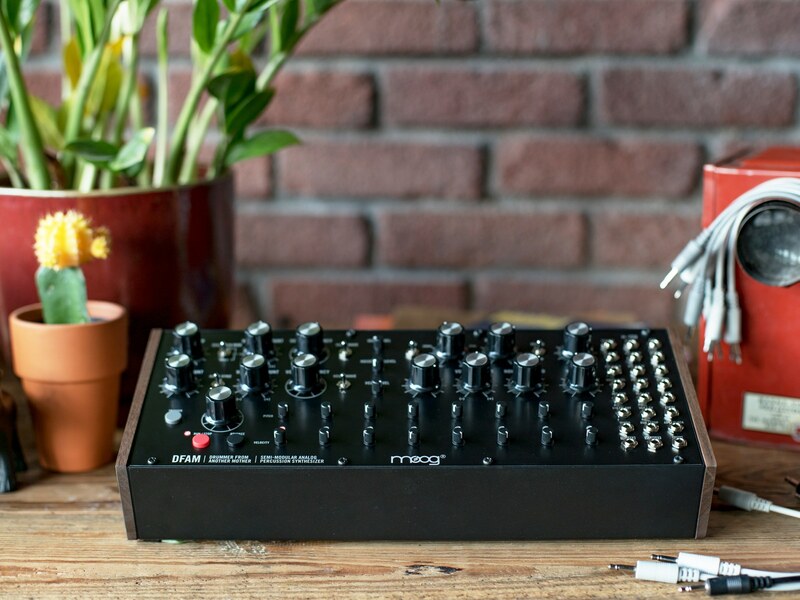 Moog Music introduces the Drummer From Another Mother (DFAM), the first addition to the Mother eco-system of semi-modular analog synthesizers. DFAM is an original electronic instrument for the exploration of new concepts in rhythm and resonance. The Moog DFAM isn’t unexpected. During Moogfest 2017 the DFAM was available to make as a DIY project. A highly-interactive, Semi-Modular Analog Percussion Synthesizer, the first addition to the Mother ecosystem of electronic instruments and each DFAM includes a package of patch cables, inviting interconnectivity via the synthesizer’s 24-point modular patchbay. Create new sounds or bizarre behaviors, synchronize an unlimited number of DFAM and Mother-32 synthesizers together, or fully integrate this analog instrument into a modular Eurorack production environment. Activated by an easy-to-use analogue sequencer, DFAM’s emotive sound begins with a white noise generator and two wide-range analogue oscillators – effortlessly transitioning between rhythmic pulsations, resounding bass and resonant bells in an instant. DFAM’s distinctive voice is then shaped by a classic Moog Ladder filter with two selectable modes: Low Pass mode imparts impact and dimension to each sound it touches, while High Pass mode opens the door to naturally expressive strikes, spikes and clangorous accentuations. The Drummer From Another Mother can generate fat analog rhythms without patching a single cable — and its modular patchbay yields endless creative possibilities. Dual oscillators plus noise offer a huge range of sounds and timbres to explore, while LP/HP filters allow for extreme sound shaping. Complete with a dynamic eight-step sequencer, the Moog DFAM is a versatile percussion synth with undeniable vibe. With two selectable analog filters — highpass and lowpass — the Moog DFAM can shape its dual oscillators and noise generator in myriad ways. From bright hi-hat sounds to deep kicks and thumps, DFAM delivers analog drum and percussion sounds at their finest. And by using its patchbay to creatively modulate things like oscillator pitch, filter cutoff, and noise level, you can generate all manner of bursts, clangs, and other sound effects. To demonstrate the range of sounds of the new instrument, Moog Music enlisted three artists from New York’s Discwoman collective, DJ Haram, Stud1nt and Umfang, who appear in the video. PATCHBAY INPUTS: Trigger, VCA CV, Velocity, VCA Decay, External Audio, VCF Decay, Noise Level, VCO Decay, VCF Mod, VCO 1 CV, 1?2 FM Amount, VCO 2 CV, Tempo, Run/Stop, Advance/Clock. Retailing in India at : ₹47,500 this looks, sounds and performs like everything Moog has ever build and nothing like anything Moog have ever built so far. Although it’s primary purpose is percussion, it not a one trick pony. It can create shattering basses and out of space fx. Although, the connectivity options are restricted to CV only, the lack of USB/MIDI might make it prohibitive for some users, but there are ways to get around that.